Nestled in a remote area deep in the mountains of Hyogo Prefecture that receives several meters of snowfall each winter is Antai-ji temple, a training monastery for Zen Buddhism that attracts practitioners from all over the world. 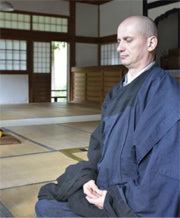 Serving as the temple's ninth-generation abbot is the German monk Muho N旦lke. Toshio Matsubara visited the temple to talk with him. Antai-ji is a Zen training center where practitioners put the Buddhist adage that "practice itself is an expression of enlightenment" to work in their daily lives. Trainees cultivate the temple's fields and practice complete self-sufficiency, continuing their learning through communal living. While Antai-ji was originally a training monastery for aspiring Buddhist monks, since N旦lke became abbot in 2002, it has also opened its doors to the general public and begun accepting those wishing to become practitioners from around the world. Practitioners number more than a thousand, half of whom are foreigners, mainly from Europe. Born in 1968, N旦lke's first encounter with Zen Buddhism dates back to his first year of high school at age sixteen. N旦lke had lost his beloved mother at the age of seven, and had continued to torture himself with the question of "why do people live?" It was at that time that the teacher in charge of a Zen Buddhism club at his high school recommended zazen (seated meditation) to N旦lke. "Until then, I'd repeatedly questioned the path my life should take and never found the answer, but I felt intuitively that this path lay with Zen Buddhism. Up to that point I thought of the human body as nothing more than a tool, but I felt that breathing, the beating of my heart and everything about my body was a part of me. My hope to study more about Zen and Buddhism developed in a perfectly natural way." After graduating from high school N旦lke went on to pursue Japanese Studies at Berlin Free University. In 1990 he attended Kyoto University as a foreign student and after graduating from university he made another trip to Japan in 1992, which was when he began full-fledged training to become a Zen monk. Including his time as a foreign student, the majority of N旦lke's training took place at Antai-ji, which had been recommended to him by an acquaintance. 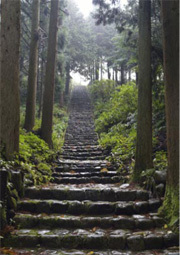 Antai-ji lies at the top of a long flight of stone steps amid steep mountains lush with dense forests. There are two phrases which have served as powerful guides while living the life dedicated to training, says N旦lke. The first is what he was suddenly told by the abbot when he visited Antai-ji when he was a foreign student: "Antai-ji is what you make of it." The second is the harsh words delivered to N旦lke by a senior monk at the same Antai-ji monastery after he returned to Japan a second time: "No one cares about you!" The former meant that Antai-ji does not have some fixed and determined presence; it only exists through each person continuing to create and change it. The latter meant that unless you completely cast away the existence of "I" and forget your ego, that you will create neither Antai-ji nor your own life. N旦lke recounts that while the two lines were seemingly paradoxical, he realized that they were two sides of the same coin. "I often get asked, 'what do you become when you practice zazen a lot?' and there is a simple answer. You don't become anything by practicing zazen. Unlike meditation, zazen is simply sitting. You discard everything, worries and desires alike, and hurl yourself entirely into zazen. Continuing to realize 'now, here, this self' is the study of Zen." For a period of six months from the autumn of 2001, N旦lke pitched a tent on the grounds of Osaka Castle and pursued a homeless life while providing a place for the general public to experience zazen. He met his wife at this zazen training center. It was at that moment that the abbot of Antai-ji suddenly died in an accident, and on short notice N旦lke was appointed to take over as the ninth abbot of the monastery. This was another turn of fate. In the time since, N旦lke set up a webpage offered in twelve different languages and began accepting practitioners of all nationalities free of charge. The texts composed on the website have gradually attracted attention, and already four books have been written by N旦lke in response to requests from publishers. "Today, the world is undergoing great change. As a recommendation to the coming new society, I hope Antai-ji becomes a model for multiculturalism. We all sweat together, live the Zen lifestyle of self-sufficiency in each other's company and do our utmost to communicate while accepting cultural differences. I hope that through actual experiences at Antai-ji, we can create the bonds that will serve as the foundation for that new sense of fellowship."